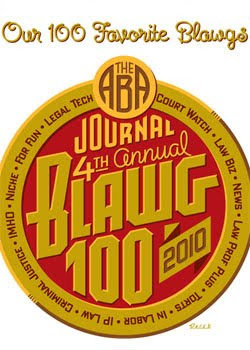 We here at Abnormal Use are very pleased to announce that our humble blog was selected yesterday for inclusion in the ABA Journal‘s Blawg 100, the “annual list of the best of the blawgosphere.” It was less than a year ago, in January, when we began this fateful enterprise, and we’ve posted each business day since that time on the latest products liability cases and news. Now, after nearly 250 posts, almost a dozen interviews with law professors and practitioners, and a sizable quantity of Friday Links, we’re not quite veterans, but we believe we’re starting to get the hang of the slings and arrows of this blogging thing. When we first heard the news we weren’t quite certain how to react. We tried to play it cool, but we were never successful at creating such a facade. 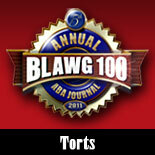 Cynical as we purport to be, we’re actually rank sentimentalists at heart, and we’re quite honored to be included among the other seven torts blogs, those being the Boston Personal Injury Lawyer Blog, the Drug and Device Law Blog, the FDA Law Blog, Jackson on Consumer Class Actions and Mass Torts, Marler Blog, New York Personal Injury Law Blog, and The Pop Tort. We’re still a little shocked. This project would certainly not have been possible without the support of our firm. Kudos also go to our two principal authors Phil Reeves and Stephanie Flynn, as well as our five associate contributors: Kevin Couch, Jim Dedman, Mary Giorgi, Laura Simons, and Frances Zacher. We also thank former contributor Dan Eller for his work on the project during 2010. 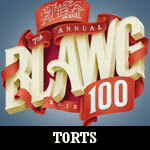 Further, we would not be what we are today without the support of other blogs, including the Drug and Device Law blog as well as the Overlawyered and Point of Law blogs, all of which served as an inspiration to us as we prepared to enter the blogosphere just over a year ago. 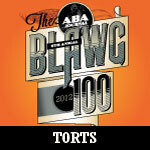 Finally, we thank everyone who nominated us for inclusion in the list. We’ve got just one more favor to ask. 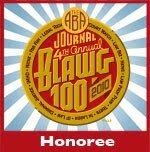 After announcing the final 100 blawgs, the ABA Journal is now asking its readers to vote for the best of the final 100 in 12 substantive categories. 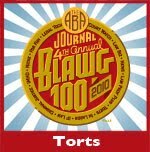 Our blog is included in the Torts category, and we ask that you register at the ABA Journal‘s site and cast a vote for us here. And if that’s not enough, we’ve got some big things in store for you in the coming weeks. Don’t forget: You can follow Abnormal Use on Twitter at @gwblawfirm. 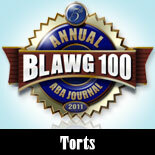 (In fact, check out our GWB 2.0 website for all of our social media endeavors as a blog and law firm.). Thank you again, dear readers, for your visits to our site and support. We very much appreciate it, and we are looking forward to bringing you another year of commentary in 2011.